The result of the Habana trials: rushing out to buy three more! As the above photo might suggest, the quality and performance of Habana notebooks were such that I found it necessary to immediately procure three more. When it comes to good notebooks and pens, I’ve long thought it necessary to stock up just in case something untoward happens such as the product being discontinued, or enduring some disagreeable modification, or even something of lesser consequence like the fall of Western Civilization. 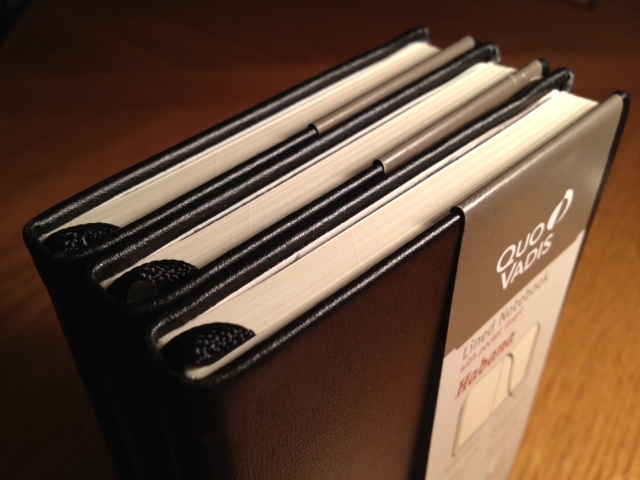 Quo Vadis’ Habana is an excellent notebook; it is by far the best I’ve encountered to date. Construction is of very good quality and even after some time with it in the field, I’ve seen nothing suggestive of the contrary: no loose pages, no ominous tears in the binding. I’m rather looking forward to brining a Habana along on the next trip abroad, for it certainly seem durable enough to serve as a travel notebook. Of the Habana’s many wonderful attributes, one of the standouts is the paper. 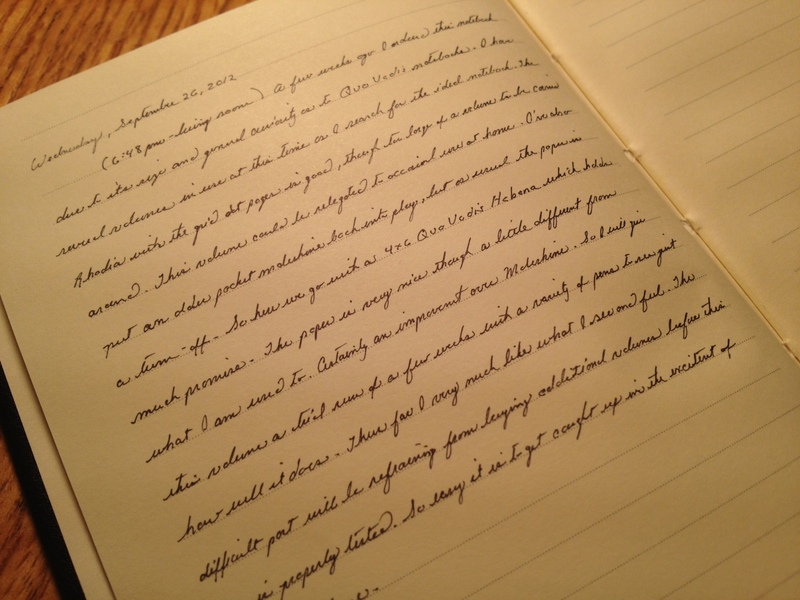 Anyone familiar with this blog knows well the importance of paper quality to me; it can be the deal breaker for an otherwise good notebook. Habanas come equipped with 80 sheets of 85 gr ruled ivory Clairfontaine paper which provides a delightful and smooth medium upon which to write. The ruling is fairly narrow (around 6mm) which works well, though a slightly narrower ruling (4-5mm) would be ideal for my tiny penmanship. Every type of pen used during this trial performed flawlessly, especially the Sakura Pigma Microns (.20 point) which have long been among my favorites. There is *gasp* absolutely no shadowing on the back of a written page. While on occasion I will use a fountain pen, I have yet to try it on Habana paper, but given its good quality, I’m confident as to a positive outcome. And I rather like fewer number of pages in a Habana, as it provides less stress on the hand whilst writing, especially as one works their way down the page towards the bottom. This has always been an inconvenience with thicker notebooks. So in this sense, less is actually more. I’ve long thought that the perfect size for a pocket notebook is 4″x6,” providing ample enough space for writing without feeling cramped and still remain portable. After nearly six weeks of carrying the Habana here, there, and everywhere in my back pocket, jacket pocket, backpack, and camera bag, I’m convinced that 4″x6″ is indeed the ideal size for pocket notebooks. In terms of portability, it’s entirely comparable to the more widely available 3″x5″ sizes on the market. The cover of the Habana has a slight flex to it, which seems to facilitate portability. Initially I had a few reservations about the somewhat flexible cover as I tend to do much of writing on the go and was concerned as to whether or not it would provide sufficient support. I’m happy to report that it does. So at any rate, I’m well pleased with the Habana experience and am satisfied that I’ve found a quality notebook line to use for the forseeable future. This is not to say that I’ve ceased the quest for the perfect notebook, nor that I won’t try other notebooks should they catch my eye. What I can say with confidence is that competitors have their work cut out for them if they hope to surpass Quo Vadis’ Habana line.